On the eve of the broadcast premiere of the first two episodes of Season 5, veteran “LOST” spotter Howard Hsu sent word of a location shoot in downtown Honolulu. 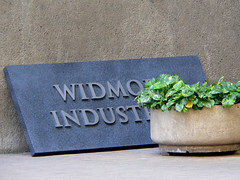 They recreated, on a smaller scale, the Widmore Industries exterior seen in Episode 3×08, “Flashes Before Your Eyes.” The signs were back, as well as the mysteriously omnipresent green newsstand. Background extras, dressed up and dressed warmly, swarmed the breezeway, as Alan Dale (Charles Widmore) talked on the phone. Meanwhile, a second unit was filming near the Waikiki Yacht Club at Magic Island. Local fans looking to watch the premiere with others have a few options. Once again, Planet Hollywood (2155 Kalakaua Ave.) is hosting a “LOST” Premiere Party (and weekly viewing parties). Groups and those wishing to upgrade their experience to “VIP” status — which includes access to a seating area with five plasma screen televisions and exclusive drink specials — should call (808) 924-7406. Übersocialite Christa Wittmier, meanwhile, sends late word of a “LOST” viewing party at Giovanni Pastrami (227 Lewers St.). Compared to the flashier Planet Hollywood gig, I would guess that Giovanni offers a less noisy and chaotic experience for those who want to focus on the show… and probably better food and beer. Call (808) 923-2100 for more information. Finally, in years past, Tropical Smoothie Cafe (88 Piikoi St.) has also hosted weekly “LOST” viewing parties. It’s run by former “LOST” actor and presumed “LOST” fan Teddy Wells. I expect the same will be the case for Season 5, but I haven’t been able to get anyone to answer the phone. Maybe you’ll have better luck? (808) 593-7373. The return of “LOST” also means I’ll be making periodic appearances on KITV‘s morning show. I’ll be on before dawn tomorrow morning to preview the Season 5 Premiere, then return on Thursday to review the episode.